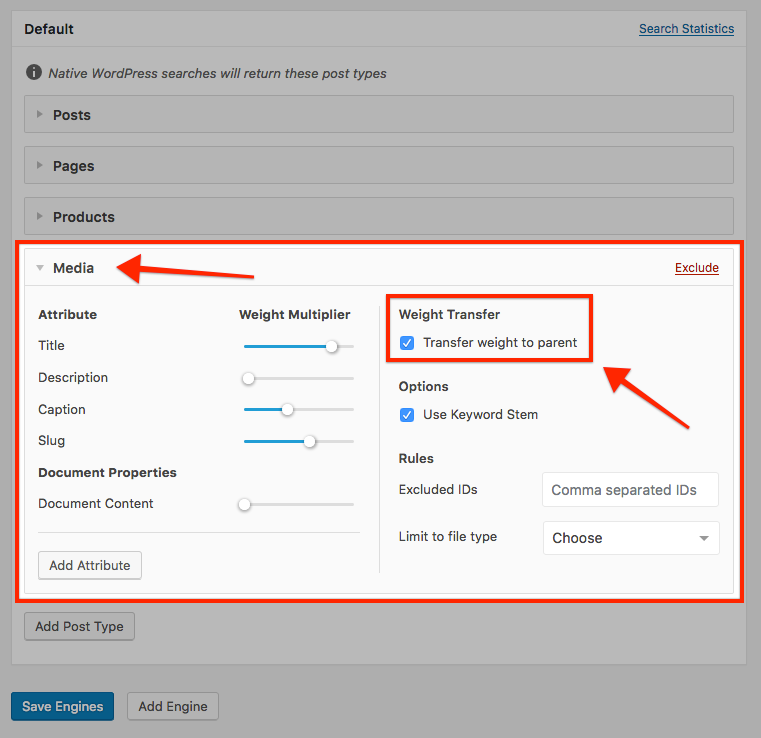 One of SearchWP’s most powerful features is the ability to attribute result weight of one post to another. To put it another way: when you attach WordPress Media to a post, that post is the ‘parent’ of the Media file. You can tell SearchWP that when it finds search result weight for Media to not link to the Attachment page itself (which not many people use anyway) and instead transfer that search weight to the parent. When you’ve configured SearchWP in this way, Media is considered as much as any other post, but entries will never be linked directly on search results pages because you’ve transferred all of the keyword weight to the parent. This results in a more natural workflow because you’re directed to the post in which a PDF is linked instead of the PDF itself, for example. When this filter is added, your standard excerpt will be shown on search results pages, but if a post has attached PDFs that contain search terms those specific PDFs will be called out by title with a supporting contextual excerpt from that PDF including at least one of the search terms as well. These callouts are appended to the original excerpt, so you don’t lose that valuable information in this process.